Your mental state while you eat has a profound effect on digestion. If you are at ease during meals, you tend to chew food much better, the digestive juices flow better, and your abdominal muscles are relaxed. This helps to digest and absorb your food better and build a stronger immune system. On the other hand, if you eat in a hurry or under stress, the digestion process gets affected and can result in stomach ulcers, stomach cramps, gas, heartburn, diarrhea or reduced digestion and absorption of nutrients. If you are under stress, take a 10-minute walk before you sit for your meal. 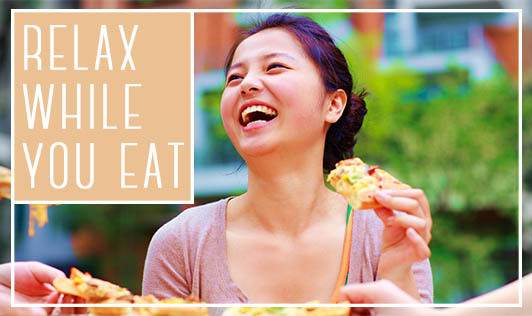 The short exercise will help to relax you and improve your appetite. Switch off your computer, television and video games. Keep your mobile phone aside, preferably on silent mode till you finish eating. Concentrate on the food in front of you. Learn to enjoy the flavors. As far as possible don’t let anything or anyone disturb you till you have completed your meal.